I’ve been off sugar for three years now and I still struggle with cravings. Here’s my secret weapon in my own war against sugar. I’ve been off sugar for three years now. And I’ve shared tips and tricks with millions around the world on how to do so with (relative) ease. But between you and me, I still struggle with cravings. Sugar is so addictive, some say as addictive as cocaine and heroin, and it’s dangled in front of us everywhere we turn. What’s more, we’re actually biologically programmed to binge on it and to be obsessed by it. This is because it’s such a fantastic way for us to get instantly… yes… fat. Back in caveman times, when we needed as much fat as we could get and sugar was very rare (a few bitter berries here and there), this made sense. Today, of course, these cravings land us in dire trouble and we have to fight our cravings. I have a secret weapon that I like to use in my own personal war against sugar. It stops cravings in their tracks and also deals with mid-afternoon energy slumps. Ready for it? It’s coconut oil. Yep, I eat it directly from the jar after lunch. Or I mix it with a little raw cacao powder to make the simplest chocolate snack on the planet. How so? 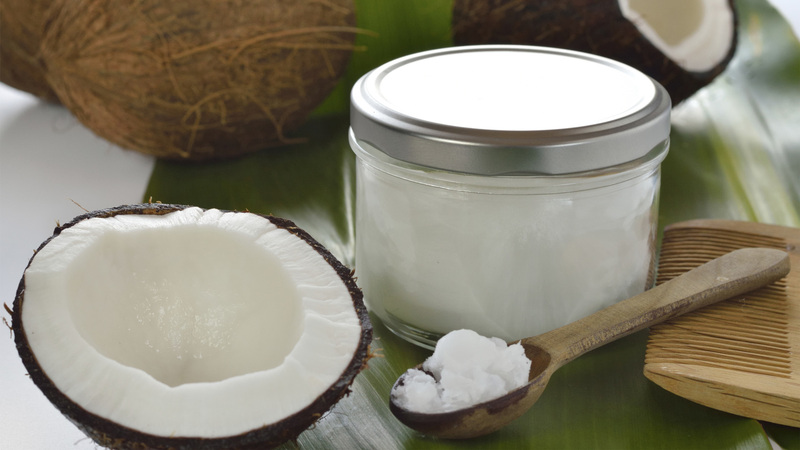 Coconut oil is made up of medium-chain fatty acids, or medium-chain triglycerides (MCTs). Indeed, coconut oil is nature’s richest source of MCTs. These fatty acids produce a host of health benefits which you can read about here. But here’s the bit I like: your body sends medium-chain fatty acids straight to your liver to use as energy. This means coconut oil is a source of instant energy, much like sugar and other simple carbohydrates. But although both deliver quick energy to your body, unlike the carbohydrates, coconut oil does not produce an insulin spike in your bloodstream. This saves you from a slump, and is really good news for anyone struggling with insulin issues. Like me. It fills you up, immediately. After two tablespoons I’m not hungry for about four hours. And bonus: it helps you lose weight! Again, it’s the medium-chain fatty acids. Most plant oils are made up of longer chain fat triglycerides (LCTs). LCTs are typically stored in the body as fat; MCTs are transported directly to the liver, promoting “thermogenesis” which increases the body’s metabolism. There are a stack of studies that have shown this to be the case, like this one. This study shows eating two tablespoons of coconut oil with a meal caused body temperature to rise, boosting metabolism. Plus, MCTs are not easily converted into stored triglycerides and cannot be readily used by the body to make larger fat molecules. For more tips and recipes, pre-order Sarah’s book I Quit Sugar today (and get a bonus sugar-free cocktail cookbook! ).